This past Tuesday was a busy one for not only the History and Archives Committee, but the whole Council. 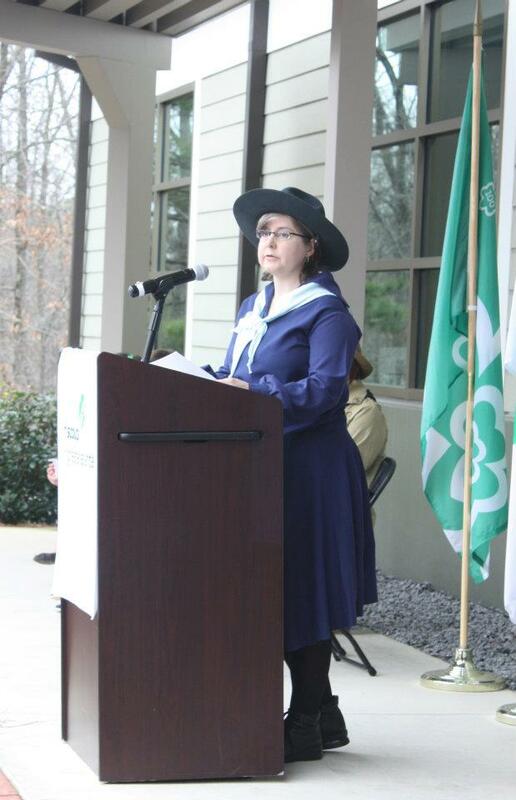 In a wonderful turn of events, the Council hosted the CEO of GSUSA, Anna Maria Chavez, at the 100th Anniversary Time Capsule Dedication and Girl Scout Day ceremonies. The committee decided to wear some of the original and replica uniforms to honor the occasion. Several attendees at the event enjoyed learning about the uniforms and the history behind them. The committee were asked several times to pose for cameras, and we happily obliged. The first event, held at Camp Timber Ridge, began with a great talk from Anna Maria Chavez. 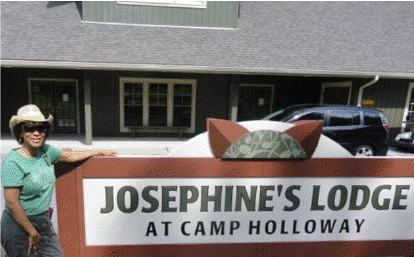 It was great to hear her perspective and plans for the Girl Scouts. 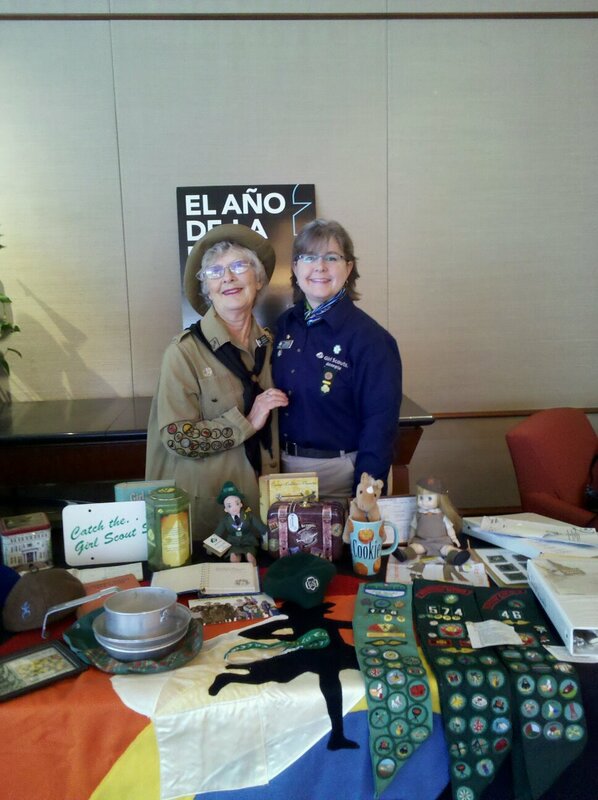 She was energetic, lively, and very committed to making Girl Scouts the best place to be for girls. Afterwards, in our chat with her, we were glad to hear that she is a history buff as well. 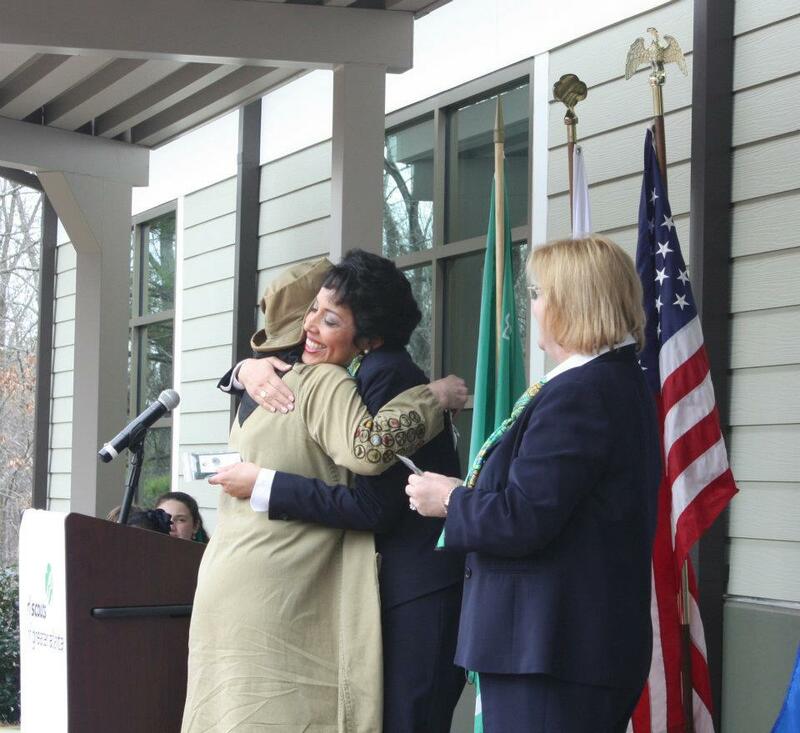 Linda Bishop presenting Anna Maria Chavez and Marilyn Midyette with our "Girl Scouts Make History" pin. Afterwards, all of the event participants headed back to the Council offices for the 100th Anniversary Time Capsule dedication. The Archives committee had been working for several months with Council staff to make this the best time capsule we could possibly make. 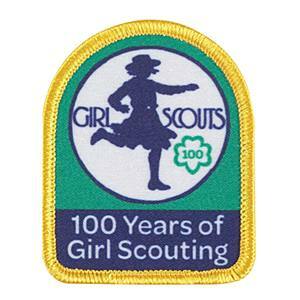 Not only were Council items and 100th GS Anniversary memorabilia included, the Council reached out to current Girl Scouts of all levels and asked them to contribute an item they thought significant. Linda Bishop, chair of the Archives Committee presented to Anna Maria Chavez and Marilyn Midyette, CEO of Girl Scouts of Greater Atlanta, our “Girl Scouts Make History” pin, as our thanks and appreciation for working together with the committee. As you can see from the picture, Linda presented the pins in her traditional manner. Pamela Nye in the 1913 blue uniform. The hat was a bit hit! Pamela Nye gave a short speech on the importance of time capsules, and of the Archives’ role in keeping safe not only the list of items enclosed in the capsule, but the location of the capsule as well. Too many time capsules have been lost or forgotten, and we do not intend for this one to suffer that same fate. The life span of electronic records is amazingly brief, so any audio, video, or electronic records will be held in the Council Archives for safekeeping, and to be able to migrate the records to whatever the next medium will be. We also want the current Girl Scouts, adult volunteers, and interested researchers to be able to access this information. All the items that were placed inside the time capsule are either eye readable records or cloth materials that won’t break down over time. A full list of contents will be posted soon. 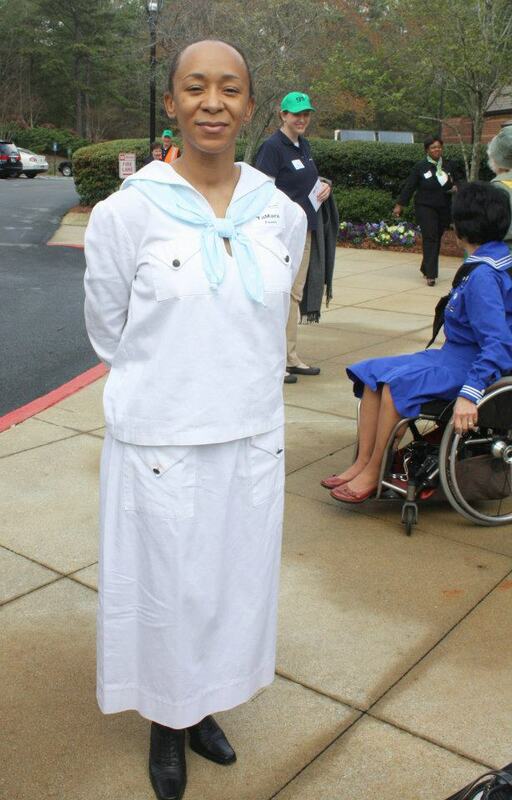 TaMara Powell demonstrating how the white uniform was worn. The event was a great success, and we were glad to see so many people come out and celebrate this momentous occasion. Here are a few news stories about the event. 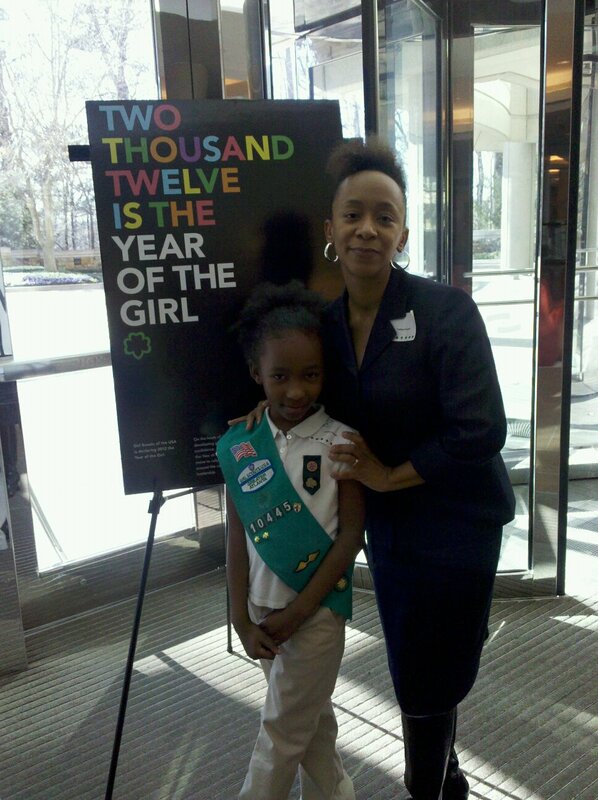 There have been over 50 million women in the United States who have been a Girl Scout, and there are anniversary celebrations happening all over the country today, March 12, 2012. 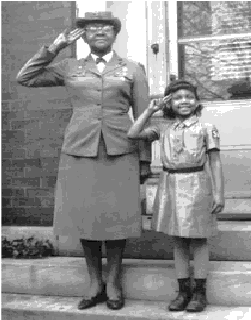 On this date in 1912, Juliette “Daisy” Gordon Low started the very first Girl Scout troop in Savannah, Georgia. Today, 3.2 million girls are Girl Scouts in the United States, and are part of the 10 million girls who are members of the World Association of Girl Guides and Girl Scouts. Juliette Low faced many obstacles, but she had a vision that this organization would help girls not only in her lifetime, but far into the future. The 1933 Girl Scout Handbook included a message from her, written on October 31, 1924. I hope that we shall all remember the rules of this Girl Scouting game of ours. They are: to play fair, to play in your place, and to play for your side and not for yourself. 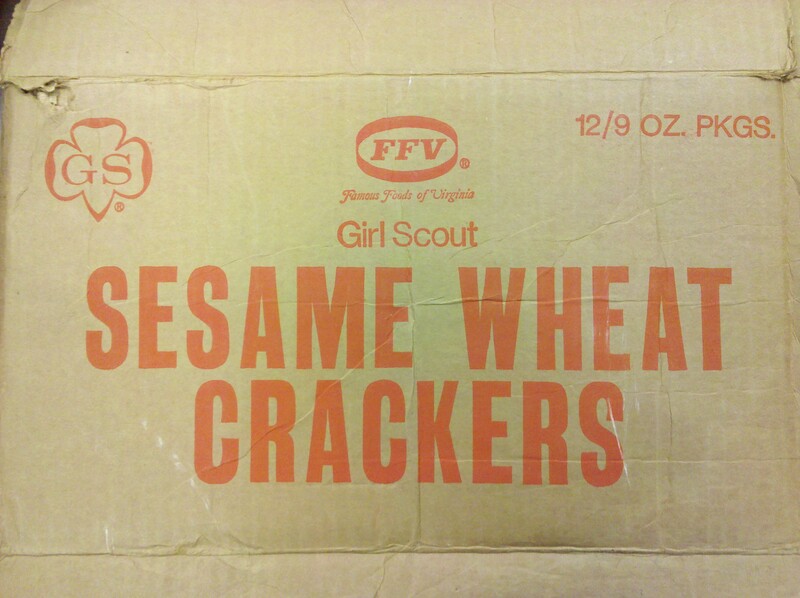 Girl Scouts, I salute you. 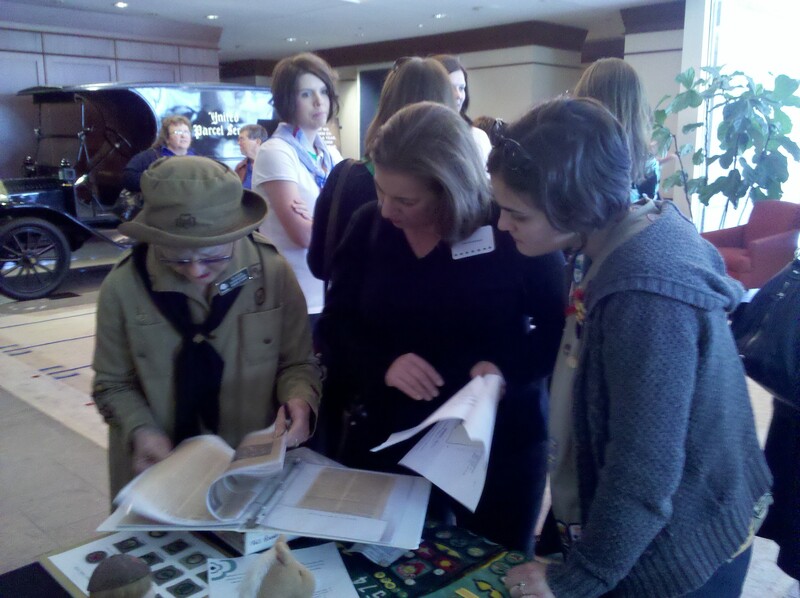 Another exhibit featuring material from the Girl Scouts of Greater Atlanta Archives is “100 Years of Girl Scouting” in Duluth, Georgia. 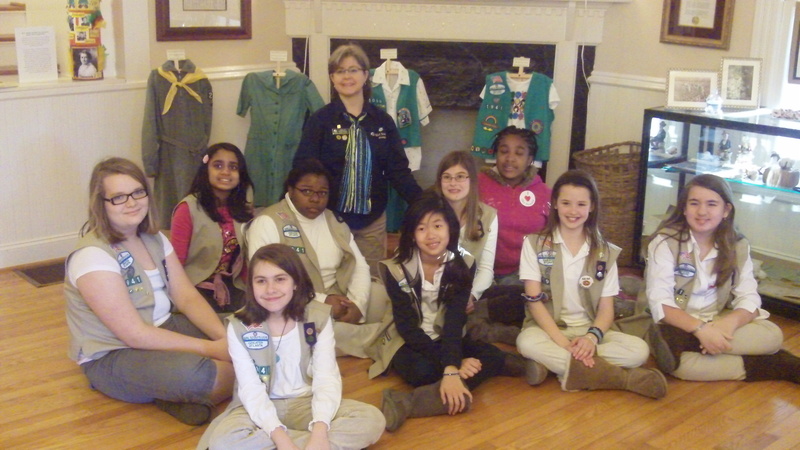 While there is a contemporary exhibit at Duluth City Hall, featuring local Girl Scouts’ community projects, the historical artifacts are located at the Strickland House in Duluth, Georgia. Currently the home of the Duluth Historical Society, the Strickland House is also the home to several Girl Scout troops who meet there on a regular basis. One of the troops, sixth grade Cadette Troop 1941, has met there for three years, and wanted to help out the DHS for being so welcoming. Since this is the 100th anniversary of Girl Scouts in the USA, the girls wanted to create an exhibit celebrating local Girl Scout history. They borrowed a few items from the Council Archives, but also borrowed a great number of items from local community members. One woman loaned her grandmother’s 1937 Intermediate uniform, her mother’s 1960s-era Junior uniform, and her 1990s-era Junior uniform. 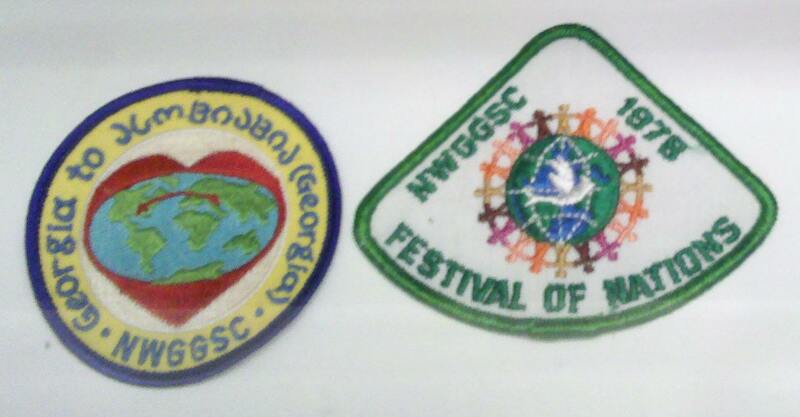 These were placed next to a current Junior uniform, showing the change in our Council’s name. The Cadettes held an Open House on Sunday, February 12, from 3:00-5:00 pm, and gave free tours of the collection. Many of the donors came, as well as many community members who had never been in the Strickland House. 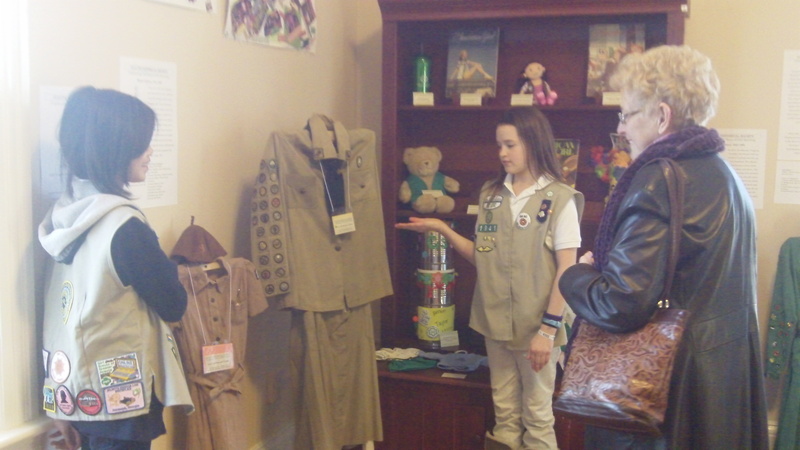 The Cadettes enjoyed their roles as docents and had fun explaining the history of Girl Scouting and the significance of the items in the cases and on stands to the guests. 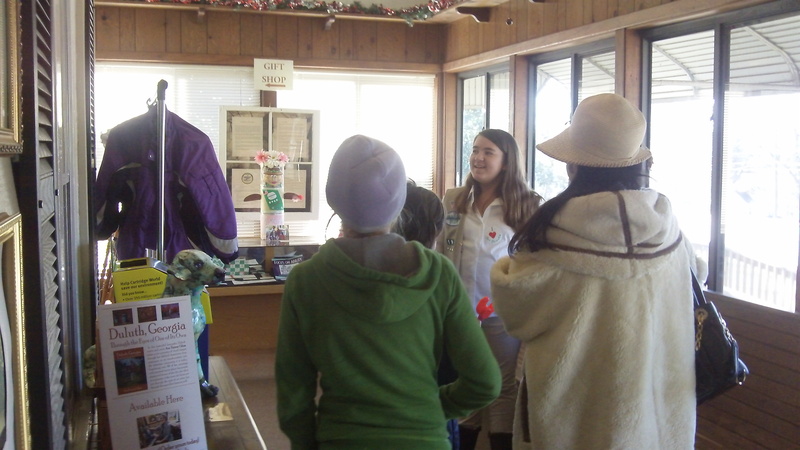 The refreshments included lemonade and the early Girl Scout cookies in the side tea room. The exhibit at Duluth City Hall and the exhibit at the Strickland House is available until April 28, 2012. Hours at the Duluth City Hall are Monday through Friday from 9:00 am to 5:00 pm. Hours at the Strickland House are Friday and Saturday from 12:00 to 3:00 pm. Tours can be arranged at other times. Visit http://www.duluthistorical.org/ for more information. 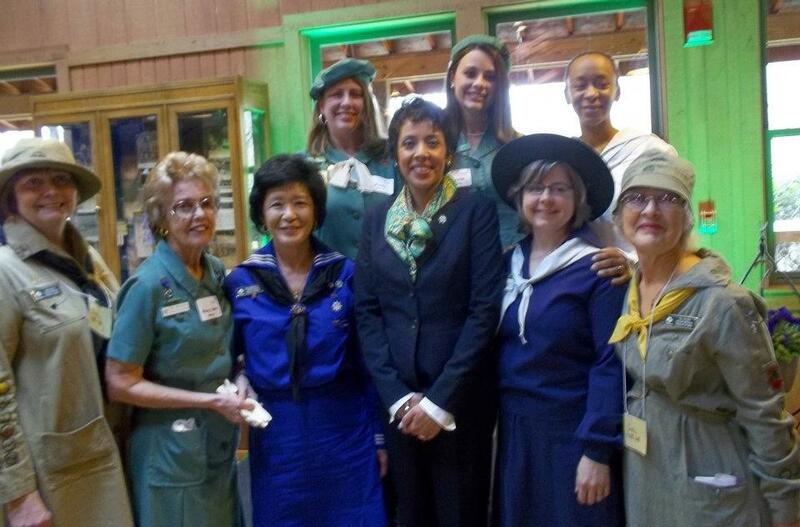 The History/Archives Committee were well-represented today at the Girl Scouts of Greater Atlanta’s 100th Anniversary Kickoff for Alumnae event. The event was co-hosted by the UPS Women’s Leadership Development and Girl Scouts of Greater Atlanta (GSGATL) Alumnae Association. GSUSA defines Girl Scout alumnae as women who were Girl Scouts (including Brownies) as girl, and/or adult members ages 18 and up, including current and former volunteers and staff. 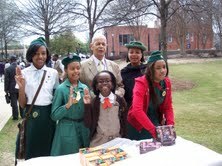 The GSGATL Alumnae association held this event to invite all former Girl Scouts to “Be Counted! Get Connected!” during 2012. We listened to a great event introduction by Marilyn Midyette, Council CEO. The next part of the program featured current Girl Scouts who were invited to share their thoughts about their experiences. TaMara Powell is one of our History/Archives volunteers, and her daughter Chloe was the first young lady who came to the stage to talk about her experiences in the current scouting program. She did an amazing job and it was a pleasure to hear her speak. Attendees also learned ways to volunteer in short-term projects, such as helping with upcoming 100th Anniversary events, or volunteer in long-term projects, such as joining related alumnae groups, like the Gold Award Alliance, the Trefoil Guild, and the History/Archives Committee. We have many members on the History/Archives Committee who are also members of these other committees, and it is great to have such a wealth of knowledge just a phone call (or email) away. Mary Ann Milton, for example, came to the stage to speak about the Trefoil Guild, but she is also an active History/Archives committee member. The Archives Committee had a table outside the lecture hall to display a small sampling of what is available at the Mableton location. We had a great time showing everyone what we had and were available for a wide range of questions. Most of the attendees came to the table saying, “I remember that!’ or “I had that!” It was fun to speak with them about their own personal collections and to find out their stories. Two of our committee members also wore historic uniforms, and were asked every few minutes if someone could take their picture. 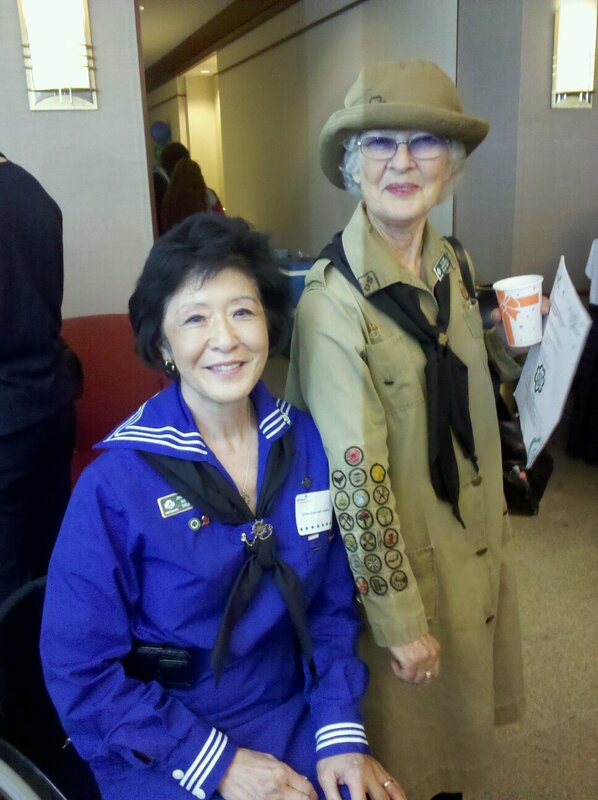 Joyce Overcash-Dudley wore a Mariners uniform representing all the girls who used to be in a naval Girl Scout program (including herself as a younger Girl Scout). Sue Belden wore one of our original uniforms, dated 1914-1928, from the Archives collection. We were most excited about being able to speak directly to more leaders about the opportunities to work with the girls. With the new badge, “Girl Scout Way,” in all the handbooks–Daisies through Ambassadors–we have a great connection with the girls (and leaders) in learning more about Girl Scout history. We are also developing programs for the girls to come in and earn some service hours while helping to preserve and make accessible our history. Lots of memories were shared, and we encouraged everyone to sign up to get more information about the Archives and all of our activities. We told attendees about the blog, Facebook, and Twitter feeds, and even met a few who already subscribe to the various lists. It was a great experience to speak with all who came to the table, and look forward to working with many more volunteers in the future! Many thanks to the committee members who attended today: Sue Belden, Mary Ann Milton, Joyce Overcash-Dudley, Patty McIver, TaMara Powell, and Pamela Nye.